This article is about demonology. For other uses, see Baal (disambiguation). 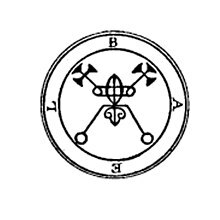 Baal (/ˈbeɪl/ BAYL; sometimes spelled Bael, Baël (French), Baell, Buel) is one of the seven princes of Hell in 17th-century goetic occult writings. The name is drawn from the Canaanite deity Baal mentioned in the Hebrew Bible as the primary god of the Phoenicians. In this hierarchy, Baal (usually spelt "Bael" in this context; there is a possibility that the two figures aren't connected) is ranked as the first and principal king of Hell, ruling over the East. According to some authors, Baal is a Duke with sixty-six legions of demons under his command. According to Francis Barrett, he has the power to make those who invoke him invisible. During the English Puritan period, Baal was either compared to Satan or considered his main assistant. Some demonologists believe his power is stronger in October. The origin of Halloween in Samhain was believed to involve pagan worship and sacrifice to Baal. 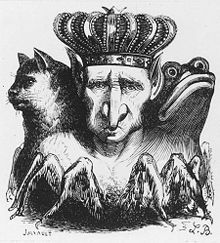 While his Semitic predecessor was depicted as a man or a bull, the demon Baal was in grimoire tradition said to appear in the forms of a man, cat, toad, or combinations thereof. An illustration in Jacques Collin de Plancy's 1818 book Dictionnaire Infernal placed the heads of the three creatures onto a set of spider legs. ^ "Halloween & Baal Worship". ^ "Halloween: The Eve of the Devil". ^ "Baal / Bael Part 1 - Demonology Profile". ^ "All About Demon Baal". This page was last edited on 20 April 2019, at 05:51 (UTC).